The idea of a monochromatic garden isn’t a new one, but it is a good one. Good enough to justify republishing this blog post, even. This time, though, we have another link for you to investigate. 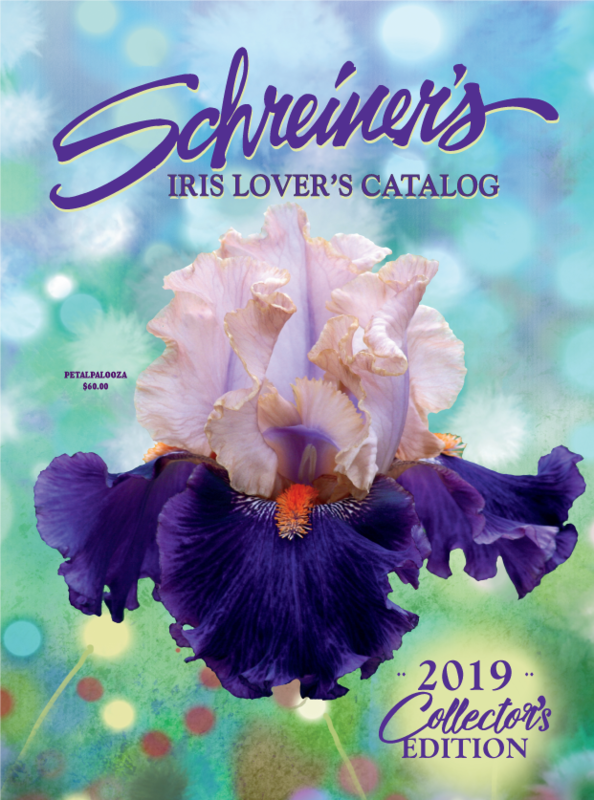 Blogger Susanne Holland Spicker recently published a visually fantastic description of monochromatic Iris plantings on the American Iris Society’s blog “World of Irises”. Click to read Ms. Holland Spicker’s post, “The Blue Iris Garden“. Bearded Iris represent the full spectrum of the rainbow. 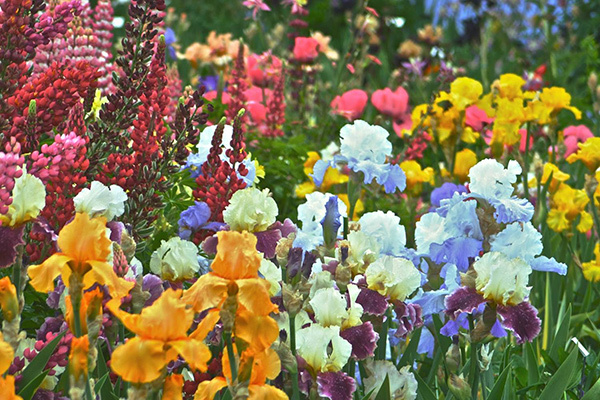 Planting a full range of colors in your garden brings brightness and variety to the scene. Some of us like the mixed up rainbow effect, others like to plant in tidy, organized blocks of color. Building upon the idea of uniform color blocks, below we present the idea of planting an area using a monochromatic theme. Monochromatic color schemes are derived from a single base hue, then extended using its shades, tones and tints…. As a result, the energy is more subtle and peaceful due to a lack of contrast of hue. * Iris blossoms in shades and tones of a single base hue move the eyes from dark to bright and back again. Let’s take purple as an easy example. The range of purples in the Bearded Iris family seemingly defy notation. Nevertheless, here is just a sample of Iris falling into the purple spectrum. A fun idea for an extreme garden might be the exclusive use of black and white! The Tall Bearded Iris shown below all have a registered bloom season of mid-to-late. When these Iris are planted in proximity, 12 to 18 inches apart, and with simultaneous bloom time, you are sure to enjoy the full impact of the color contrast. Keep in mind, when creating a visual spectrum in the garden, you many wish to choose Iris that bloom at the same time. The Iris pictured above were chosen only for their color for purposes of illustration. When selecting Iris for your garden design, pay particular attention to their listed bloom season. Also, keep in mind that Iris will bloom at slightly different times depending on the weather and climate in your area. The possibilities are endless. The wonderful thing about gardening is that you can always change things up. Experiment, have fun, let your creative spirit loose! P.S. Share images of the results of your garden design on Schreiner’s Gardens’ Facebook page. Categories: bearded iris, Garden Design, iris, Planting, Schreiner's, Uncategorized | Tags: bearded iris, flower garden, Garden Design, iris, perennial border, planting, Schreiner's Iris Gardens | Permalink. Thank you for the question. Per our hybridizer, the Iris do not revert or change color on their own. There have been instances reported of garden chemicals, such as “Round Up”, bleaching out the color from Iris, though. We suggest you document the plants’ colors (using tags perhaps) so that you can map any further changes over time. The next time you divide, you could plant identified plants into separate groups. In this way, you will be able to see how they bloom the season after they are transplanted. Best of luck to you. Feel free to update us on your progress. I planted my first iris beds last summer with the intent to have a bold patchwork of different colors. I’m excited to see how it looks (in a few years). 🙂 After reading this article, I think my next bed will incorporate a gradual color shift like you mention in the article; they look beautiful! 🙂 I might note that this look is very trendy at the moment in places other than the garden. “Ombre” is the trendy “fashion” term for the gradual color-shift/change pattern seen all over the place the past couple of years in hair color, dresses, nails, etc… Thanks for the good read. Thank you for the kind comment, Jeni. Gardening can be so rewarding, and yet can require so much patience. No doubt your “bold patchwork” will be stunning when it’s all filled in, and a thrill to watch as it develops over time. And thank you for the info on “ombre”. Iris will always be “in fashion”… but then we might be a bit biased in that regard. 😉 Best regards to you and happy gardening! I have a question I keep meaning to ask. What is the blackest black you have? It seems the blacks have a purple color to them. Thanks, Margo P.S. I already have about six of your blacks. Hello Margo, Thank you for the question. You are correct in your observation that black Iris have purple in them. They are a very dark shade of purple. Depending on the light, the same blossom can appear nearly jet black or a dark royal purple. That being said, “Hello Darkness” is very popular, and very dark. Two others we’d recommend are “Coal Seams” and “Midnight Oil”. If you haven’t already, take a look at our “Shop by Color: Black Iris” page. Here is the link: http://www.schreinersgardens.com/listitems_6173_0? Best regards and happy gardening!